The Infinite Monkey Cage is back! Now, what is he blabbering on about now, monkey cages? 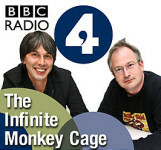 Well, it’s not my fault that Brian Cox and Robin Ince have called their science-comedy radio series on BBC4 The Infinite Monkey Cage, but since I’ve written about it in a (German-language) article about podcasts before, it’s only logical to mention that the new summer series of six episodes has already begun on Monday and is also available as a podcast on the BBC website. The radio series has been going on for a few years and most of the back episodes, 37 at the moment are available from the podcast archive. Professor Brian Cox and comedian Robin Ince are talking with their amazing guests about a multitude of scientific themes, but sometimes the discussions end up in a completely different place they started on. It’s fun, it’s interesting and also very educational, but never boring. Advanced English listening skills are of course required, but it’s very much worth it and the half-hour show has just the right length. So hop over to the podcast page, download the new episode or dive into the archives if you haven’t yet! Too much fun on the ISS? The ESA director thinks so. 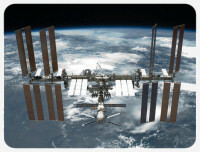 Canadian astronaut Chris Hadfield had been instrumental in bringing human spaceflight back into the limelight, but the phenomenal success of his great outreach work did not please everbody: yesterday there was an article in the German edition of Spiegel Online in which ESA director Thomas Reiter complains about the cult around the International Space Station (English Google-translated version here). He says that too much of the minor and unimportant events like eating, taking photos and making music are thrust into the foreground, while the serious science is being neglected. Reiter stops short of directly criticizing his former colleague Chris Hadfield, with whom he actually played some guitar back in 1995 during a Mir mission as Spiegel Online points out, but his tone is exactly the problem we have here in Germany with everthing science-related: having fun is not allowed, it all has to be serious. I think Reiter’s comments about Chris Hadfield are not particularly fair, since the Canadian had actually reported a lot about science experiments and the general experience of space flight, always making it clear that it’s not all fun and games on the ISS. There are tons of detailed information available on the web about the science experiments on the ISS, but much of that is of such technical nature that it would be hard to explain to non-scientists – Chris Hadfield had, however, found the right balance between entertainment and seriousness. Calling Hadfields work sensationalism shows that Thomas Reiter might have lost touch with the public – when asked if he would have pursued an “internet career” like Hadfield if the technical capabilities had existed during his time in space, he only answers with a forceful “no”. This reaction is all the more astonishing because Reiter is a veteran astronaut himself, having logged 350 hours in space during two long-duration missions on Mir in 1995 and on the ISS in 2006. He mentions that today’s astronauts have another mentality, but completely ignores that he himself is actually about the same age as Chris Hadfield. What Reiter is right about is the fixation of the media on the actually rather inconsequential events on the space station, but this is not the fault of the outreach work of the astronauts themselves. But his demand to report only about the serious science is the wrong approach – it’s the fun things of space exploration that will get adults and children interested in science, astronomy and even spaceflight, not the dry and serious science. This is exactly the problem that NASA and ESA have had for a long time – their earlier outreach work has been somewhat dull and only got better in the last few years, but it took an Canadian astronaut to raise even more popularity. ESA astronaut Luca Parmitano is on the way to become Hadfields successor with his frequent postings on several social networks and he still maintains the same healthy mix of gorgeous photos from orbit, reports about his daily science work and his life in orbit. Yes, there has been some hoopla about ESA’s recently arrived ATV transporter carrying some tasty italian cuisine and that’s another point Thomas Reiter complains about, but the astronauts are not prisoners and their well-being should matter as much as every science experiment. Next year, the German ESA astronaut Alexander Gerst, a civilian scientist, will join the ISS as a crew member – this would be the chance for Germany to step in and do the same great outreach work as Chris Hadfield and Luca Parmitano. The chances are looking good – Gerst has an own website, maintains a Flickr account and is also active on Twitter. The ISS is not all about science, but also about long-term living in space – while the many scientific experiments are undoubtetly important, we should also not forget that the astronauts are human beings like you and me. Maybe Thomas Reiter has forgotten this. Google Reader Shutdown – are you ready? Next Monday, July 1st, Google is going to close down its RSS Reader – I’ve written about it before in March and found a temporary solution in May for keeping my Android tablet connected. Since then, a lot has happened, especially regarding the gReader app I’m using to read news on the tablet. The good news is that the program will continue to work next week, but not exactly in the way I had described in my last article in May. It turns out that a local installation of Tiny Tiny RSS is not needed after all, because the programmer of gReader has chosen to work with Feedly, who now not only provides a RSS web reader, but also access for third-party readers like gReader like described in this announcement. • Go to Feedly.com and log in with your Google credentials. No seperate account is necessary, the safe OAuth authencification takes care of that. Feedly will then import all your Google Reader RSS feeds which are then available from the Feedly Cloud web interface and through their API for other external apps. This can also be done by installing the Feedly app on your Android device and logging in with your Google account, but it’s now also possible to do it only via the website. • For safety and potential importing into other apps or programs, also go to Google Takeout and export your RSS feeds into a file. There is no way of importing this file into Feedly at the moment that I’m aware of, but it could be important for other programs like Tiny Tiny RSS. • Download the latest version 3.3.3 of gReader from the Google Play Store on your Android device. This version has built-in support for Feedly, which will be displayed on the initial login screen as the bottom option. Just log in as usual with your Google account and your RSS feeds will appear like they did before – only now they’re coming from Feedly and not from Google Reader. This works with both the free and paid versions. The only thing getting lost is the sort order of the feeds, but this can be done inside the app itself. • Note that gReader 3.3.3 does not have support for Tiny Tiny RSS at the moment. The programmer has chosen to remove this option because of some undefined instability issues, But he is working on a completely new app called News+, which is based on gReader, but will have seperate extensions for access to different services, TT-RSS amongst them. There is only an early beta version at the moment which works only with the phone UI, but the potential is there. It is not yet known if News+ will succeed gReader – at the moment, gReader seems to be the current version, but maybe it will transform into News+ in the future. So, the future of RSS on Android (and, of course, also on the web) has been saved by Feedly, which is not a bad thing at all. Someone had to be the first to take over and I think Feedly has done the right thing by opening up their API and also providing a slick web interface with the functionality of Google Reader. All this proves one thing: Google was wrong to shut down its RSS reader, plain and simple. I’ll never get to my long-prepared list for Music Monday if Meri Amber keeps this up, but I’m not complaining – this time she wrote a little song called House Number Three, which is definitively not your stereotypical lovestory. But it involves channeling your inner child, which I’m very much in favour for :-). Back in April I wrote about the dire situation the budget sequestration in the USA has created for the amazing citizen science project CosmoQuest. They not only bring much needed science education to American schools, but also run online courses, science projects everyone can participate in and, of course, a whole lot of podcasts and hangouts. Now much of what they do could be in danger of extinction soon because they are funded by a government grant which is going to be cut soon – but they’re not giving up yet! The hangout will start on Saturday, June 15th at 12pm EST or 6pm/18:00 CEST and will be split in six parts, which are all linked to on the main event page – there’s also a schedule available which is still in the process of filling up. Everything will, of course, be archived on Youtube as usual, so even if you don’t have time to view it all live (which would admittedly be rather difficult), you can always view the recordings later. All you need to watch is a computer, tablet or smartphone on which you can view Youtube videos and streams on – and a Google+ account if you want to leave comments, because there will be a lot of interaction! If you want to watch on an Android device, see my article from last year on how to watch Google+ Hangouts under Android. While the Hangout-A-Thon is not a pay-per-view event and watching is free, the whole reason for this amazing event is to raise money for CosmoQuest. So if you like what they are doing and care about science and astronomy education not only in the USA but worldwide, please consider making a donation – I’m sure that even small amounts are going to help and even I am going to send them a little something of $20 or so. I think it’s only fair after having watched so many of their brilliant hangouts! 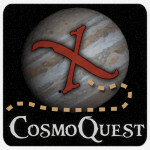 Note: CosmoQuest logo borrowed without permission, but I’m sure they don’t mind. I’m not affiliated with CosmoQuest, at most I’m an unsolicited volunteer – I just believe in what they do and want to help spread their cause. On Wednesday evening, the European Space Agency shot this inconspicuously-looking vehicle into space – it’s the fourth of their space freighters, the Automated Transfer Vehicles, which deliver cargo, fuel and other goods to the International Space Station. Number 4 is called fittingly Albert Einstein and will arrive on the station on June 15th. The night launch from the ESA spaceport in Korou was perfect and the vessel is now in orbit catching up to the ISS – and waiting for another unmanned Progress freighter to leave the station so it can dock. The ESA has made some amazing videos of the launch available: the Launch Highlights are even more exciting than the live broadcast because more camera angles have been used and there are some words from ESA astronaut and space station inhabitant Luca Parmitano at the end. Even more amazing is the on-board video provided by the experimental Sterex camera built by a German company, not only showing the launch, but also the separation of the stages. You’ve got to hand it to the ESA – their media operations have dramatically improved and the broadcast from the launch and their videos have become even better than those from the NASA. The launch of ATV-4 would perhaps not gotten any attention in the news, if it wasn’t for the fact that it carries some italian food specialities. Actually, there has been an article with the title Luca’s lasagne on the ESA blog for months now, talking about the problems of food preparation for astronauts. There’s going to be a feast when ATV-4 arrives on the station next week for sure – there’s no publicly available shipping list, but several news articles write about lasagna, risotto, parmesan cheese and tiramisu. Hopefully the freeze-dried versions taste as good as the fresh thing. 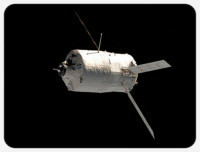 If there’s one thing that would keep me from traveling to space it’s the food situation! I also managed a bit of a feat yesterday – I managed to take a photo of the ISS flying over Mülheim just in the moment the ATV was launching from Korou! As usual, in addition to the posting on my own photography blog, I shared the photo on Facebook and Google+ – and on the latter network, to my complete and utter amazement, my photo got re-shared by the ESA in their stream. And it wasn’t even such a great photo, the one from yesterday was much better. But still… wow :-).